Today I'm interviewing fellow Blogger, Patsy Collins, who is launching her debut novel, Escape to the County, this month. 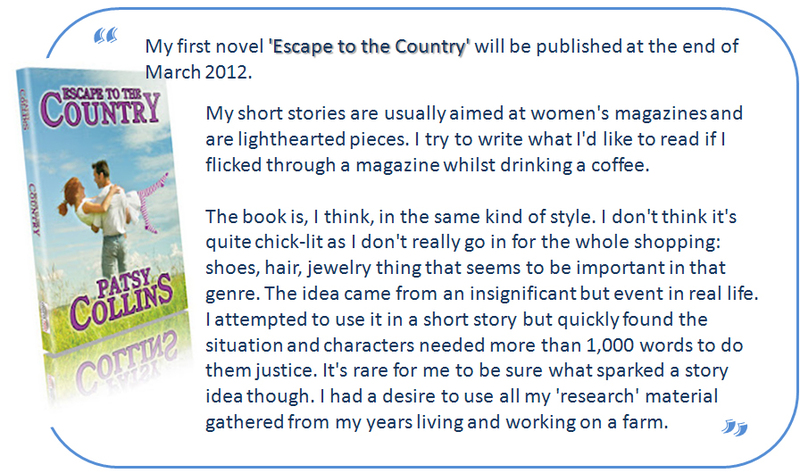 Today I'm interviewing fellow Blogger, Patsy Collins, who is launching her debut novel, Escape to the County, this month. good luck with the book launch, Patsy. See Interview #2; Interview #3; Interview #4. Just checking in with everyone. Thanks for all your supportive comments about my romance vignette. 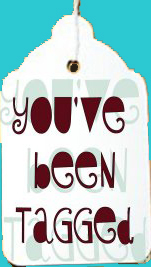 Welcome to all my new followers and Thank You to all my existing followers. This week looks like it's going to be busy, so I'm not ignoring you, I'm just otherwise engaged... Oh and it's hubby's birthday today. I have scheduled some posts in forthcoming days and will come and visit as many of you as possible, again, when I get a moment. I do hope life is well with you all. 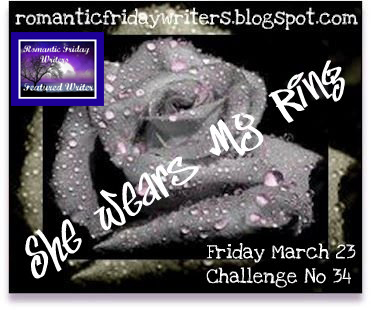 She Wears My Ring ~ What's Your idea of Romance? 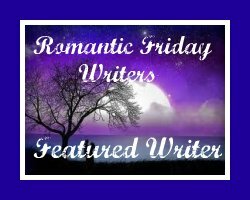 This week's prompt for Romantic Friday Writers Once you've written your entry, post to your blog, then copy the link to the linky on RFW. Write a maximum of 400 words in response to the prompt. 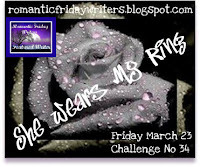 The words 'she wears my ring' must be used, however you wish. Any genre. We sit together in the lounge squeezed between the other residents. A television blathers on in the corner. I help her drink her tea from a cup with a spout. The room smells faintly of stale tea and institutionalised meals. I try to swallow the prickly crustacean of emotion that is lodged in my throat, remembering the day I slipped the white-gold band onto her slender finger as we exchanged our vows, when chestnut curls framed her heart-shaped face, while her hazel eyes were bright with tears of happiness. The curls are now more wispy-white and her eyes look across at me with a distant blankness that drags at my heart. Still she wears my ring, after fifty-six years of marriage. Though her memories drift in and out, I can still see the essence of Mary in her smile; her warm and loving nature that helped us through the hardest of times. Her zany sense of humour that always attracted even the most reserved admirers, still remains in her more lucid moments. “We had a card from Cousin Margery” I say. “Is Margery coming to see me?” she responds. “Not today, love. Maybe next week” I lie, it doesn’t matter, she won’t remember. “What’s for dinner?” she asks, conversationally. “Fish, mash and veg. One your favourites” It’s better to make it sound appetising, I’ve found. “Oh, Is Margery coming for dinner?” she asks with a warm smile. “Maybe she’ll come next week” I say, keeping my tone level. This isn’t the retirement we had planned. I imagine us going for country walks together, hand in hand, laughing and sharing. I imagine the cuddles and the intimacy. The warmth of her affection and my heart swells with love for the woman I married. I hold her hand, now so soft and pink since she no longer attends to the housework. They are no longer parchment-dry from dish washing. I will always love the essence of my Mary, forever grateful that she chose to wear my ring above, all others. So what do you think? Does it fit your idea of romance? As many of you will know, this theme is something close to my heart. 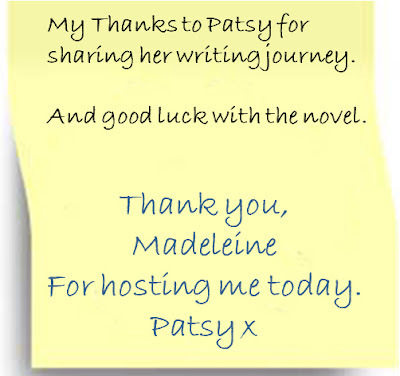 RFW said: We both chose Madeleine Maddocks for her heartfelt romantic story of an elderly couple. It was a beautifully written vignette, well deserving of the FW title. 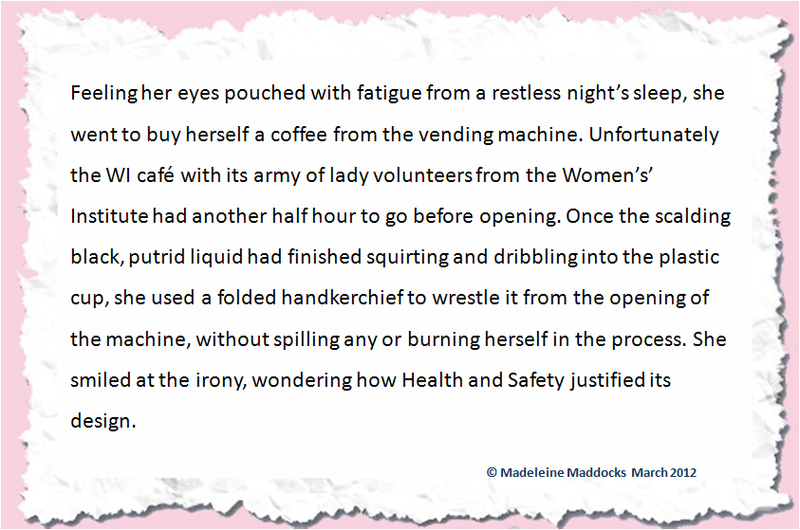 Donna Madeleine's story had me in tears - of nostalgic longing for a life that wasn't mine, but I'd wish for in my old age. This story embodies the "rocking chair" concept marriage. From the first words out, to the end, this excerpt built a story; a life of companionship, compromises and enduring faith in each other. What completely captured me was the line "Though her memories drift in and out, I can still see the essence of Mary . ." Everything after was showing how he saw both the girl he married, and the woman she'd matured into. This concise excerpt completely revealed a life lived in everyday romance, not just special occasions. Denise Madeleine tore at my heartstrings. Man, that girl knows how to hit the 'emotion' button for me. I simply adored this tale of love in God's waiting room. The love of this man for his wife was steadfast, gentle and sweet. I love how Maddy told it. It rang true to me. I've seen real life love stories played out in nursing homes and this was very real to me. I've been busy sorting out a few things work wise. Hubby's been laid up with a badly sprained ankle. and I've had no car for a whole week, as it required lots of repairs just when the mechanic took sick... thankfully it's back now. So writing/blogging has been on the back burner. and then two days later an email saying that a Flash Fiction piece had been accepted, so that was a boost! I must not give up! To all those she deemed lacked pedigree. Would lick every drop from her chin. "That's a slur!" she would say, with a grin. For she loved nothing more than her veg. And would covet his spade with a sigh. Is the one that’s a sight for sore eyes. 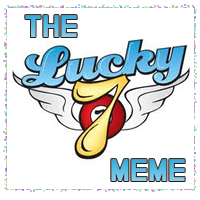 The lovely Medeia Sharif tagged me with the Lucky 7 Meme. 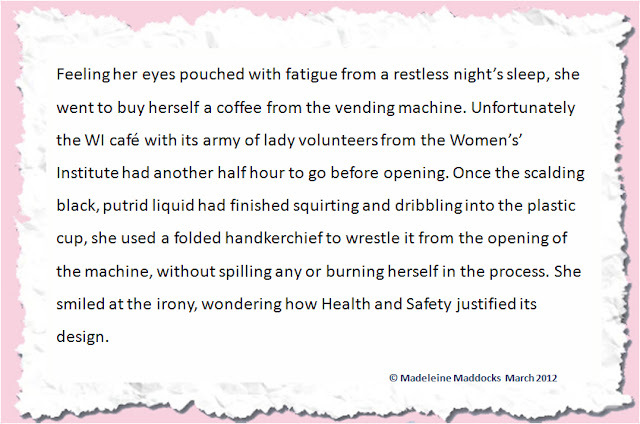 Here's my excerpt from my realistic fiction/chicklit Once Forgotten. The she in this piece is Caroline whom you've already met in previous posts. 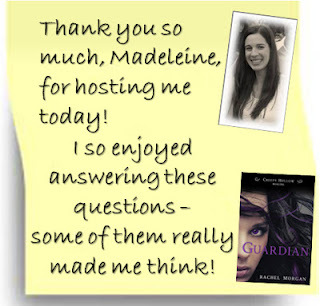 Today I have been interviewing Rachel Morgan author of the paranormal fantasy series Creepy Hollow in which Guardian is the first installment. 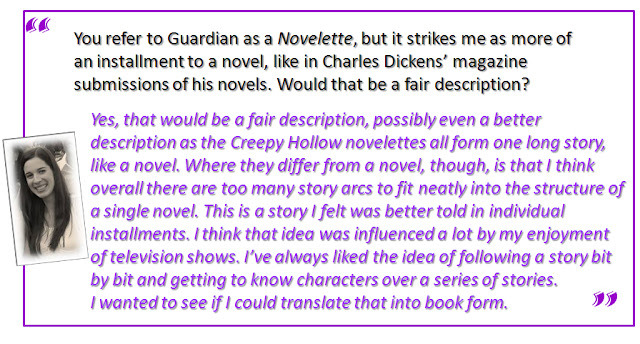 Interview post #5 See posts below for the rest of this interview. 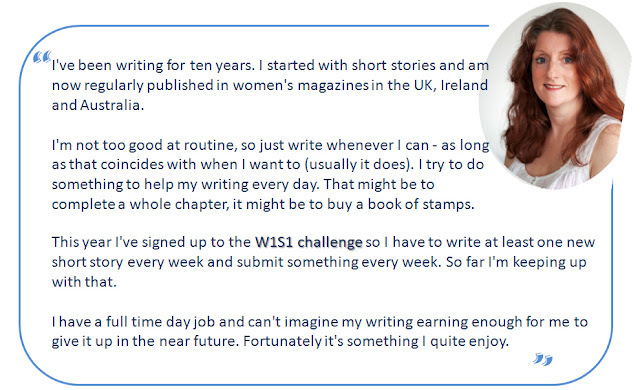 Thanks to Rachel for sharing her journey with us. 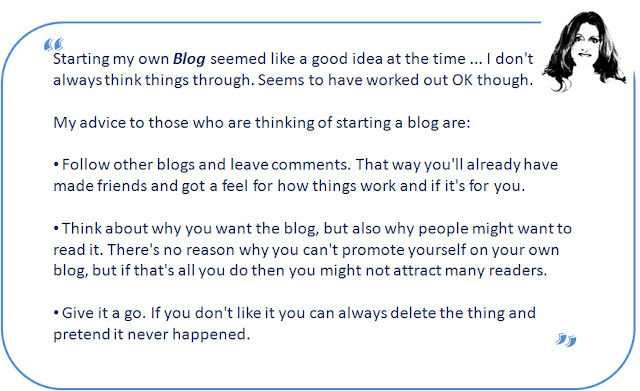 So Bloggers, Do you think this style of presentation works? Interview hop: #4 See posts above / below.Rachel Morgan author of the paranormal fantasy series Creepy Hollow in which Guardian is the first installment. so hop to my next post...thank you. Interview Hop: #3 See posts above / below. 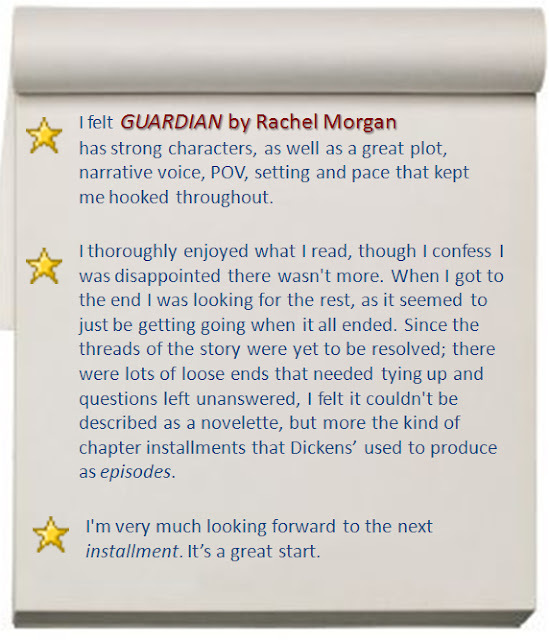 Rachel Morgan author of the paranormal fantasy series Creepy Hollow in which Guardian is the first installment. 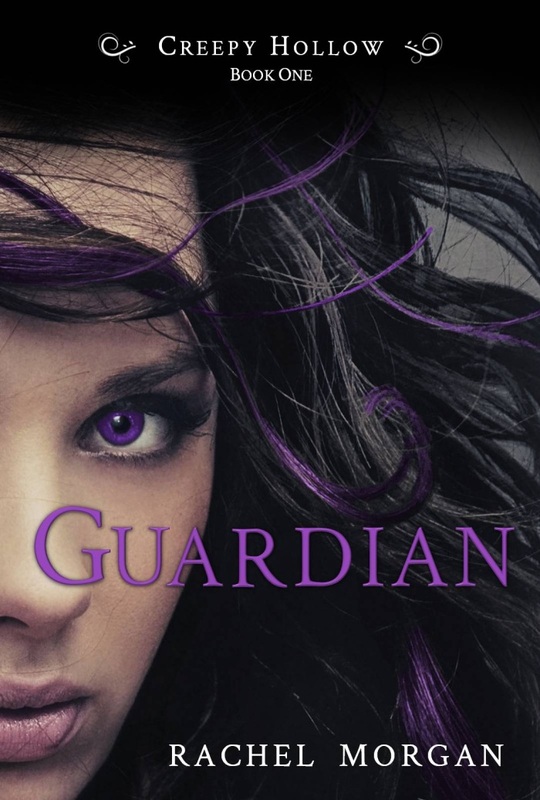 Creepy Hollow in which Guardian is the first installment. Comments will be possible at the end of the interview #5. 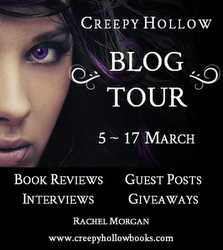 Interview hop: #1 Rachel Morgan author of the paranormal fantasy series Creepy Hollow in which Guardian is the first installment. I have devised this BLOGFEST and scheduled it for when the letter P appears on the A-Z challenge on 17th April 2012. 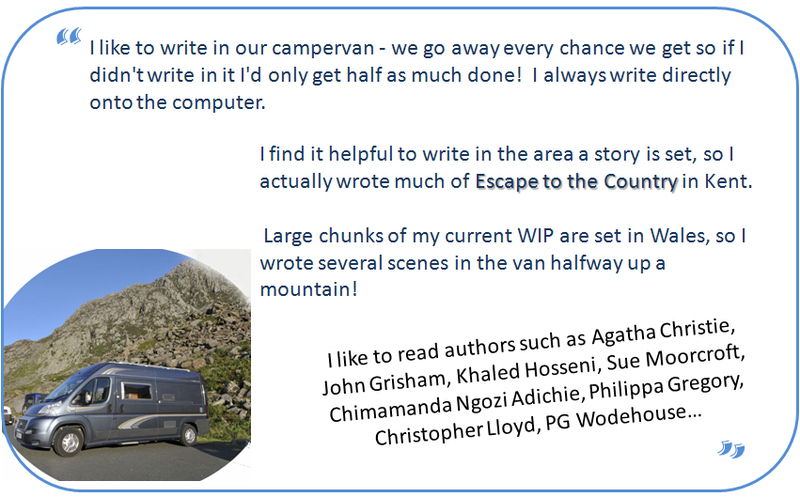 Sign up to the linky and post your tips and secrets on how you plot your novels. Even if you are a Pantser rather than a Plotter, there must be some methods you follow when writing your stories. 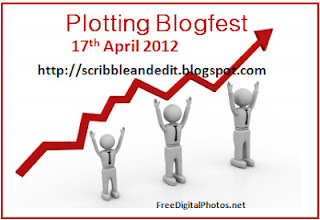 Or you can post about any aspect of plotting. Oh and do please take the logo and side bar it for me. 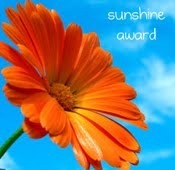 My thanks to Patsy for awarding me the Sunshine Award. It is such a lovely tribute and I always love receiving them. 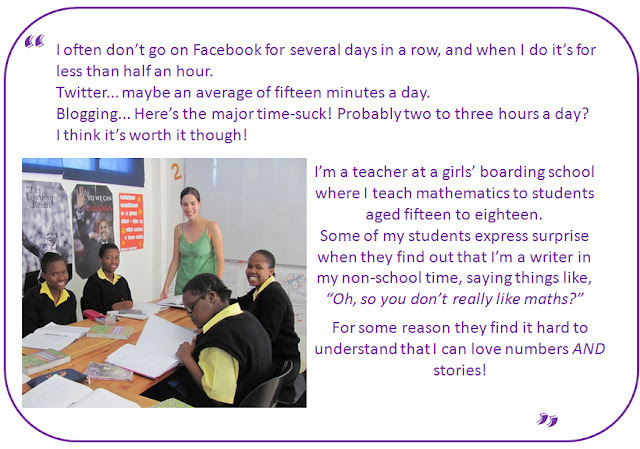 I would like to pass it on to Kelley for her Blog posts that fill the heart and mind with sunshine. To Ellie whom I've met in person, who is such a sunny person. Thank you also to Joanna for tagging me. 1) How would you cope if you were stuck in a broken-down lift? I'd not be happy. I'd hope I was with people who kept me calm. 2) Do you suffer from road rage? I can get exasperated sometimes, but not mega aggressive, no. 3) Which era would you prefer to have been born in? 4) What is the item of clothing you have loved wearing most? 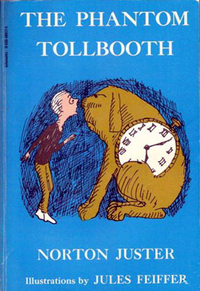 I wore a duffel coat until the sleeves became three-quarter length because I'd outgrown it! 5) Have you ever hated a holiday and why? 6) Which meal would be your worst nightmare to eat? 7) Do you like toast very brown or pale? I like it hot and crunchy and nicely browned. 8) What do you do if you can't sleep? Count all the chairs and sofas in the house going mentally from room to room. 9) Have you ever hidden when a friend knocks on your door? 10) When you sit down to write, do you keep getting up again for valid reasons, such as urgently-required biscuits? And then wonder how you ever manage to finish a story? Not really, no, but I do keep checking my emails and Blog unless I disconnect the router. 11) Who is the short story writer whose work you could read over and over again, both for pleasure or inspiration? Saki was always a favourite, though I enjoy lots of authors to get a full flavour. I was wondering whether anyone missed reading certain things on my Blog? BTW this week has been mega busy, hopefully next will be more under control. 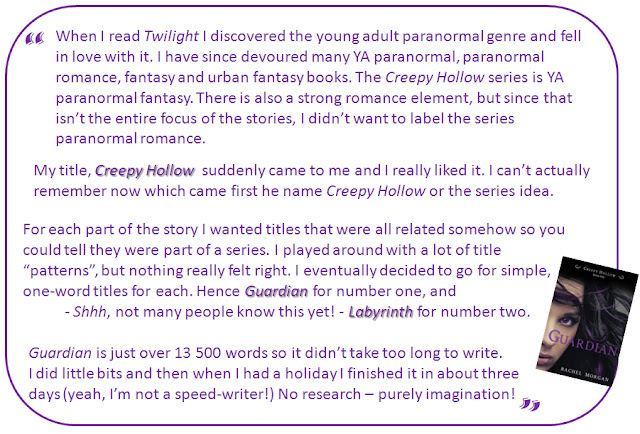 In March 2012 Rachel Morgan is launching her paranormal fantasy series, with a touch of romance, entitled CREEPY HOLLOW. It is a YA paranormal fantasy series of novelette length that will be published in ebook form each month, beginning in March 2012. Rachel Morgan was born in South Africa and spent a large portion of her childhood living in a fantasy land of her own making. These days, in between teaching mathematics to high school children, she writes fiction for young adults. Protecting humans from dangerous magical creatures is all in a day’s work for a faerie training to be a guardian. Seventeen-year-old Violet Fairdale knows this better than anyone. She’s about to become the best guardian the Guild has seen in years. That is, until one of her assignments, a human boy who shouldn’t even be able to see her, follows her into the fae realm. Now she’s broken Guild Law, a crime that could lead to her expulsion. The last thing Vi wants to do is spend any more time with the boy who got her into this mess, but the Guild requires that she return Nate to his home and make him forget everything he’s discovered of the fae realm. Easy, right? But Nate and Vi are about to land themselves in even bigger trouble and it’ll take all Vi’s training to get them out alive. So have you read it yet? Does this review make you want to read it? appearing at 2 minute intervals on the day with the last one for commenting. Is the Comma Becoming Extinct?